YSOBEL Art Gallery brings together an extraordinary group of prominent clay artists in, “Mga Putikero”. This group exhibit is on view from July 25 – August 3, 2015. Bound for their love of clay, seven of the most respected names in Philippine pottery have come together to share a bit of their story in, Mga Putikero. The exhibition features Jon and Tessy Pettyjohn from Laguna, Joey De Castro of Metro Manila, Pablo Capati III from Batangas, Pampango Benjie Ranada and Bacolod locals Joe Geraldo and Holtz Javier. The exhibit will explore the meaning, beauty and craft of ceramic art. These artists will present a strong selection of pieces ranging from the rough terracotta sculptures to the strong tradition of wood fired stone wares. Intense craftsmanship and mastery of materials will be evident in the display of works. The exhibit highlights the facets of ceramic art. Ceramics is the mother term for any clay fired to permanence; these enduring works become the legacy of the Putikero who moulded it. These masters have captured the raw and inspiring pulchritude of the Earth and forged it into indelible impressions of beauty. 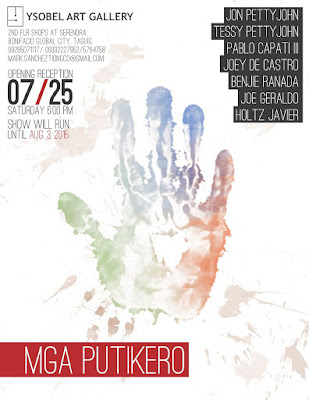 Opening and artist reception will be on July 25, 2015 ( Saturday), 6pm at YSOBEL Art Gallery, 2nd flr., Shops at Serendra,Bonifacio Global City, Taguig. Show will run until August 3, 2015. For more information you may call 09285071117/09332227952/ 5764758 or email mark.sancheztiongco@gmail.com.